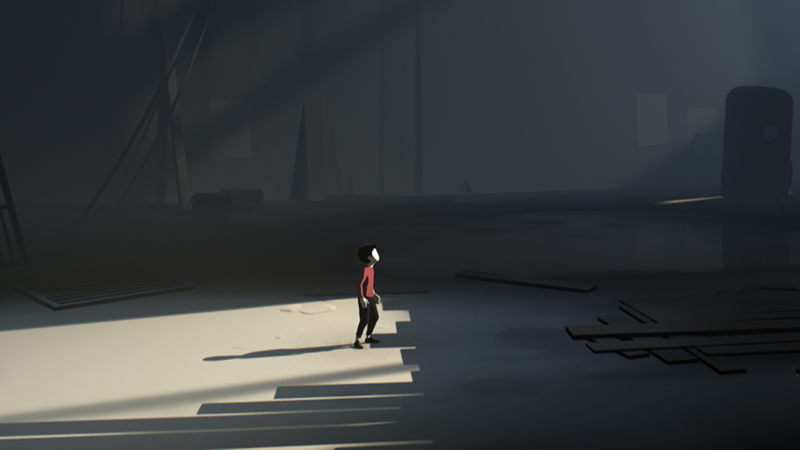 Reading The Game: Inside : All Tech Considered In this installment of our occasional series on storytelling in video games, we take a look at the dark puzzle platformer Inside. You play as a boy in a red jacket, with no special powers — so run! In Inside, you play as a boy with no special powers — just the ability to run from the monsters around you. I begin the game as a boy, on the run from dogs in a dark forest. I end it as something else entirely, lying exhausted on a beach, the dawn sun just beginning to rise. In between, a story happens — disturbing and moving and deeply, deeply weird. There are robots and sea monsters, zombies and scientists, a war (maybe), and possibly the end of the world. And not a single word has been spoken. Inside is an experiment. The developers (Playdead, who also made the game Limbo, similar in many ways to Inside) gave it the spine of one of the most primal of videogame forms — the puzzle platformer. You run, you jump, you push things and pull them. There is an internal design language to it that is the common tongue of the videogame world — a thing you know in your fingertips if you know anything at all. But to that (around it, above and below it) they have added the skin of a terrible (read: wonderful) story of death and darkness and science run amok. You come to Inside, like I did, in the dark and in a panic. You are a small boy, sliding down a hill. A boy in a red jacket with no superpowers. No guns. No bombs. No name. A boy with nothing but the ability to run and jump and swim. A boy. There is no tutorial, no pop-ups explaining what the buttons do or what the boy can do. You either know it in your bones, this physical language of button-pushing, or you don't. But one thing is obvious: something bad has happened, and you (as this perfectly ordinary boy) have to run. Now. Wordless. Nearly soundless but for the crunch of sneakers on gravel, the scrape of doors. Gasping breath. In the forest, there are men with guns and masks who will catch you and kill you if you are not fast enough. There are dogs that will tear you to pieces. You will traverse the forest, hiding from the searchlights, and then cross the abandoned highway just out of sight of the roadblock, slide down the embankment, splash into the awful, gray puddles. And that's when you start seeing all the dead pigs. Inside's story is all in the visuals — the images of the dusty, silent factory, the flooded laboratory spaces, the city where the brainwashed zombies walk and shuffle and hop in neat, orderly rows. It is in the perfect animations of the boy, sprinting and sneaking; the design that makes nearly all of his escapes so skin-of-the-teeth that you want to watch them through your fingers as the jaws snap just behind his foot rattling over the top of the chain-link fence. Your love for the boy (and you will come to love that boy) is a protective one. If you are like me, you will hesitate at the edges of things that you know will be dangerous. That will likely get him killed (closely clustered checkpoint restarts are one of Inside's few mercies). You will linger at the edge of the water, knowing that something is down there in the depths, waiting for you where you are weakest. You will hear the sound of dogs or massive, earth-shaking explosions going off in the distance and you will crouch protectively behind a wall, afraid to push forward. You run because running is what you're best at. And the story, wordlessly, tells itself. Or gives you the world, anyway, and lets you tell your own story inside it. But then you will because this is a game, and because forward is the only real option available to you. And because forward is where the story lies. Where the answers are. Like a film-loop, each advancing scene adds to the silent mass of the story that Inside is telling — the living pigs at the farm are infected with some kind of parasite that makes them crazy. Why? How? Why is every person you see either trying to catch you, stop you, kill you, or dead? Or a brainless thing, controlled by some unseen force, shuffling forward into waiting cages and trucks? Where are they going? Only forward. Always forward, away from you, faster than you can travel. So you follow because you must. Through offices, recently vacated (smoke still curling from an ashtray, a phone ominously swinging near the door) or old, ruined subways. You run because running is what you're best at. And the story, wordlessly, tells itself. Or gives you the world, anyway, and lets you tell your own story inside it. You will never even know the boy's name. You will never know what happened. You will never know the why of anything, but the possibility space it opens in your head will be vast and sad and quiet and full of monsters. In the end, there is a twist I promise you will not see coming. A deep dive into strangeness that answers nothing and makes every question even more frightening. Who are you, really? And what have you done? You are just a boy in a world beyond explanations. And you run because there are no other choices. Inside only tells the story of what you are running toward. What happens after is entirely up to you. Jason Sheehan knows stuff about food, videogames, books and Starblazers. He is currently the restaurant critic at Philadelphia magazine, but when no one is looking, he spends his time writing books about giant robots and ray guns. Tales From the Radiation Age is his latest book.